As a musical prefix, "post" can only be thrown around so many times. Subgenres begin to lose any resemblance of what inspired them. For example, there was punk. And then art degree majors liked what they heard, thus post-punk. Then kids 20 years later discovered what they did to make post-post-punk. So it would seem a bit silly to describe a band influenced by the surge of early/mid 2000s angular English indie (your Franz Ferdinands, your Bloc Partys) as post-post-pos…you get the point. And really, a label as such would only get you halfway to Unplugged and Reborn’s sound. Something," the opening track from Promise Me This Day, with its electronic drumbeat and schizophrenic synths is more along the lines of being born out of the post-Postal Service age (sorry, couldn’t resist). When the verse hits, Andres Davila’s voice does hint at a bit of British impersonation, but it is complimented nicely during the chorus with bassist Christina Hernandez adding a subtle dynamic shift. The whole album focuses on shifts and juxtapositions just like that. The second track "Windows" transitions into the rock realm filled with a downstroke guitar and an urgent drumline. Track four, "Savannah Sun," marks a new sound entirely than any of these previous RIYL names I’ve dropped would lead you to believe. It marks the heartbreak song (“Please forgive me, my sweet Christine / I don’t wanna go”) and slows down the pace of the album, but with a "Maps"-like bittersweetness, magnified by the atmospheric guitar, soothing keys and hypnotic drum effects. The tempo picks back up with "Melodic" and "Summer Air," a pair of tracks that won’t necessarily help Andres kick those Julian Casablancas comparisons. "Khandi Kids" marks the halfway point on the album and is certainly the most likely to win A Side for a single. A glitchy keys lead backed by a wandering bass and the acoustic drums of Tony Grigorio mirroring the electronic ones provide a stable backdrop behind the (and don’t let the ‘A’ word scare you) surreally autotuned vocals. The upbeat track wouldn’t be out of place on a solo drive along the lakeshore or used to get the energy up at your next party. Christina’s voice gets showcased in "Prelude," an intermission piece that features the underrated melodica (an instrument so sweet that Microsoft Word doesn’t even recognize it; but I digress). Around this time in the album comes its only defect: the length. While the dynamic shifts keep things interesting and non-repetitive, the 50 minute album could have used an edit of a track or two. Don’t get me wrong, I’m not impatient for the album to finish, but I think an accompanying EP may have been more appropriate. However, the penultimate track, "England" provides an unexpected little jazzy number segueing into the perpetual buildup of concluding "Twenty ‘Til One." Overall, the most impressive thing about this album is its ability to be dynamic yet cohesive. This isn’t an exercise in genre-treading, rather the opposing elements of electronic and rock create an array of fresh sounds. We live in an age of total accessibility and no wants to be pigeonholed as the metalhead or nerdrocker. We’re all out of high school and in the real world, where labels are eschewed in favor of exploration. If something sounds interesting, it should be expanded on, even if its original intent is forgotten. Promise Me This Day is experimental enough in its scope to not be a redundant rehashing of other bands but rather an attempt to try to understand how multiple influences intertwine with each other. 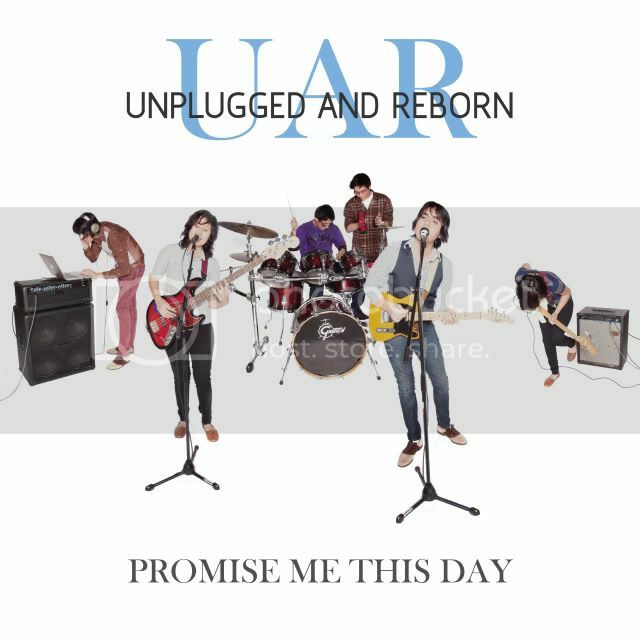 Unplugged and Reborn are throwing a CD release show Sunday, July 10 at Beat Kitchen (7:30, 17+, $10).UAR are offering a special one-time deal as well: name your price for the album, a dollar and up. Take advantage of it. Opening up are the Window Theater, the Black Tape and the Earth Program and the night will also feature local artists Enigma 013 and FEDZ. Thanks a lot for the share, it's an excellent track.